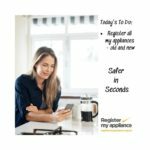 Register my appliance is a public information safety campaign which encourages people to register their domestic appliances so manufacturers know where the products are in case a safety repair is ever needed. 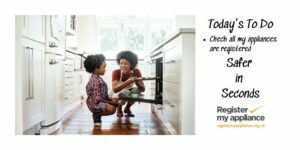 Could your organisation help by using your communications channels to get this message to your staff and residents to help them make their homes Safer in Seconds? We’re hoping you can deploy your internal channels (intranet, noticeboard etc.) 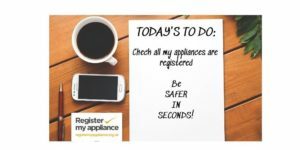 to first encourage your staff – rooted at the heart of the community as you are – to get appliances registered. 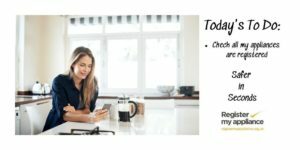 It would be great if you could also broadcast this important safety message on your external channels (social media, newsletters, magazines etc.) to all your residents. 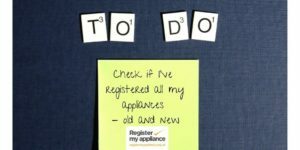 People can register 60+ brands of appliances of up to 12 years old at www.registermyappliance.org.uk. 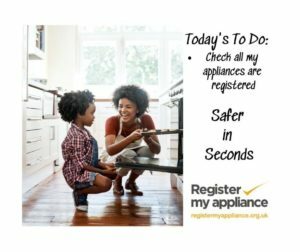 AMDEA (the Association of Manufacturers of Domestic Appliances), the UK trade association for manufacturers of large and small domestic appliances, is running the campaign. It has government backing from the Office for Public Safety and Standards, the Department of Business, Energy and Industrial Strategy and the Home Office. It also has support from Citizens Advice, Trading Standards, Local Government Association and Fire & Rescue Services. We’ve created a toolkit with examples for you to help disseminate the message. If you need any other material to fit your specific needs, please get in touch. We are keen to supply what you need. NB – PDF files may need to be copied to your desktop before they can be opened.